What is the Mayfield Area Chamber of Commerce? 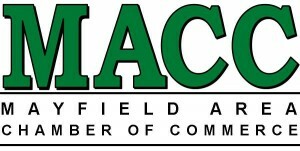 The Mayfield Area Chamber of Commerce is a group of business professionals working together to bring a myriad of benefits, services and opportunities to the businesses in the Mayfield Area. We usually have at least two groups who benefit from our fundraising efforts each year; graduating seniors from Mayfield High School and “another worthwhile recipient” as determined by our board of directors annually. We work hard to foster good relationships between our businesses, our residents and our schools. To take an active role in supporting our members by providing a professional and ethical business environment while encouraging growth and support for our communities.